Burkina Faso is a landlocked nation in West Africa. It is surrounded by six countries: Mali to the north, Niger to the east, Benin to the south east, Togo and Ghana to the south, and C�te d'Ivoire to the south west. 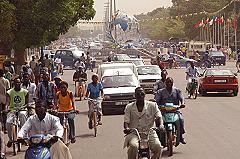 A 2002 estimate of Burkina Faso's population came in at 12,603,185. Its inhabitants are known as Burkinab�. A impoverished country, several hundred thousand farm workers migrate south every year to C�te d'Ivoire and Ghana in search of paid labour. 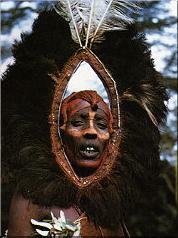 Relics of the Dogon are found in the centre-north, north and north west region. 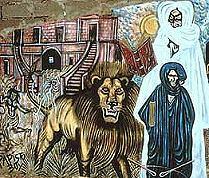 They left the area between the 15th and 16th centuries BC to settle in the cliffs of Bandiagara. Elsewhere, the remains of high walls are localised in the southwest of Burkina Faso (as well as in the C�te d'Ivoire), but the people who built them have not yet been definitely identified. In 1904, these territories were integrated into French West Africa in the heart of the Upper-Senegal-Niger (Haut-S�n�gal-Niger) colony. Its inhabitants participated in the First World War in the heart of the battalions of the Senegalese Infantry (Tirailleurs s�n�galais). It was originally administered as part of C�te d'Ivoire colony, but became a separate colony in 1919. On March 1, 1919, Fran�ois Charles Alexis �douard Hesling became the first governor of the new colony of Upper-Volta, which was broken up September 5, 1932, being shared between the C�te d�Ivoire, Mali and Niger. On September 4, 1947 Upper-Volta was recreated with its 1932 boundaries. On December 11, 1958, it achieved self-government, and became a republic and member of the Franco-African Community (La Communaut� Franco-Africaine). The current president is Blaise Compaor�, who came to power in 1987 after a coup d'�tat that killed Thomas Sankara. The constitution of June 2, 1991, established a semi-presidential government with a parliament (Assembl�e) which can be dissolved by the President of the Republic, who is elected for a term of 5 years. The year 2000 saw a constitutional amendment reducing the presidential term from 7 to 5 years, which was enforced during the 2005 elections. - The parliament consists of two chambers: the lower house (l'Assembl�e Nationale) and the upper house (la Chambre des Repr�sentants). - The south-west of the country forms a sandstone massif, where the highest peak is found: T�nakourou (749 m, 2,450 ft). The massif is bordered by sheer cliffs up to 150 metres (490 ft.) high. The country owed its former name of Upper Volta to three rivers which cross it: le Mouhoun (formerly called the Black Volta), le Nakamb� (the White Volta) and le Nazinon (the Red Volta). Le Mouhoun, along with la Como� which flows to the south west, is the country's only river which flows year-round. The country also contains numerous lakes. The principal lakes are Tingrela, Bam and Dem, and the large ponds of Oursi, B�li, Yomboli, and Markoye. Lack of work causes a high rate of emigration: for example, three million people from Burkina Faso live in C�te d'Ivoire. 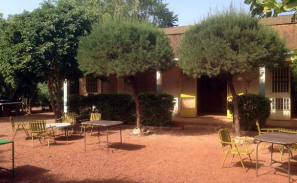 According to the Central Bank of Western African States (La Banque Centrale des �tats de l'Afrique de l'Ouest), these migrants send tens of billions of CFA francs back to Burkina Faso each year. 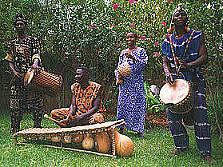 The July 2000 estimated 11,946,065 Burkinab� belong to two major West African cultural groups-the Voltaic and the Mande. The Voltaic are far more numerous and include the Mossi, who make up about one-half of the population. Additionally, about 5,000 Europeans live in Burkina Faso. LE MONDE DES GIROUETTES et COMPAGNIE est le lieu d�di� aux silhouettes pour la d�coration. Cet espace de vente propose des produits sp�cialement cr��s et fabriqu�s pour vous. Aujourd�hui, nous sommes � la recherche de produits authentiques. Fort de ce constat et conscient que tout le monde n'a v�ritablement pas le temps de chercher pour acheter ce type de produits. Nous avons rassembl�, au sein de notre catalogue, des images et silhouettes, d�clin�es en plein de produits originaux. LE MONDE DES GIROUETTES apporte un contenu, fonctionnel, simple et pratique, d�coup� en plusieurs espaces : produits pour trouver et s�lectionner simplement et rapidement. La Gacilly Cit� des M�tiers d�Art Les premiers artisans d'art se sont implant�s en 1970 dans le village de La Gacilly. Ainsi au fil du temps, La Gacilly a acquis une notori�t� dans l'accueil des professionnels des M�tiers d'Art. 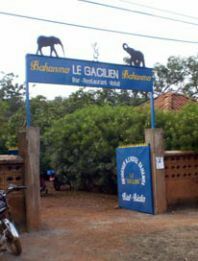 The Hotel Le Gacilien is on the main street a few blocks from the Ougapo. It is named for the town of La Gacilly in Brittany, France, Diapaga's sister city. Double hut with fan, separate WC: 3,500 FCFA. Restaurant Bahanma : breakfast 800 FCFA. VENTURES AFRICA � The Nazinga Ranch extends over 100,000 hectares and includes nearly 600 km of slopes. Nazinga is a very special type of protected area, hunting area and tourism of 97,000ha for hunting and 20,000ha for safaris lovers. Established by Robert and Lark Lungren, two Canadian brothers who grew in the country, Nazinga is a beautiful ranch with an open and a close forest, where only crop areas demarcate the territory. Many facilities were created on sight to better manage the ranch�s biodiversity. 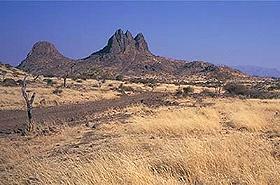 The Nazinga Ranch, is a protected area of 913 km2, located near Po in southern Burkina Faso. To combat the cyclical drought, deforestation, overgrazing, burning, soil fatigue and other devastating impact of heat on nature, the Lungren brothers decided, back in the days, to introduce a new concept at the time for West Africa, which led to the introduction of a ranch that will later combine eco tourism vision and controlled hunting. 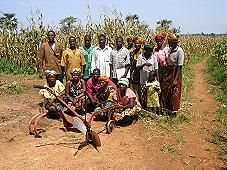 Since then, the ranch has been a very busy place: contributing to economic development of Burkina Faso. The Nazinga ranch has driven masses to its three main areas: a conservation area of 84.5 km2, a buffer area of 48.3 km2 and a hunting area of 789.6 km2, as well as some hunting areas. The ranch also attracts additional tourists to its classified forest of Sissili (327 km2), which is another hunting spot. Then, there is the Kabor� Tambi National Park, another national park of Burkina Faso situated between Ouagadougou and the border of Ghana which has a much richer fauna and follows the course of the Nazinon River. This under-protection ranch has grown considerably and today is 94,000 hectares containing more than 20,000 animals, including 800 elephants which remain the animals per excellence in this region of West Africa. Nazinga Ranch has 39 species of mammal, including thousands of antelope such as roan antelope, waterbuck, oribi, and reedbuck. In 1988, 8 Buffon�s kob were introduced to the park, plus the 500 buffalo, the 5,000 warthog, crocodile and many other primates including baboons, vervet and patas. The Nazinga ranch also has 275 species of bird including hornbills, hawk and herons. Just before you start planning a getaway to this part of West Africa, keep in mind that Burkina Faso is a Sahelian country, so the focus should be lightweight clothing and cotton clothing. However, the weather could cool down during evenings, so visitors should plan to bring a sweater and long pants to protect themselves against mosquitoes. Staying in the village of Zigla or Boala is a great idea because you will be pampered by the villagers. Learning local traditions and customs will be the best way to get to know their culture and exchange with the people who live in the heart of a great game reserve known as Nazinga.